Agreed. I own a M4 and a M6 and I find difficult to keep them in the bag. I dont have a Leica but in love with the quality of the images and the color.... ooh.. the color.. I have a Canon 20D and don't get me wrong, I love my 20D but it cannot get that film color and mood. Love all the images that people posted in pbase! The Leica M7 is an amazing camera. Ive been shooting digital since the original Canon D30 and have used them all including the Nikon D2x, and Canon 1ds and 5D. WHile those pro DSLR's are great, the Leica is my favorite camera ever, and yes I went back to film. The size, the smoothness, the shutter, the super quietness and the quality if the images are amazing. All I need is my M7, a 35, 50 and 90 lens and my film scanner. 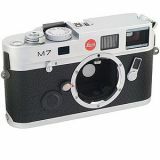 If you have ever shot a Leica M6 ir M7, you are missing out.